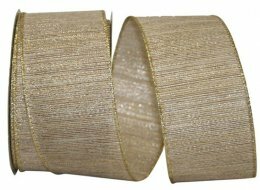 Natural Metallic Ribbon with a Wired Edge is very versatile making it ideal for wreaths, holiday & wedding decorations, floral arrangements & gifts with beautiful bows. The Ribbon Diva offers a large selection of Decorative Metallic Ribbon that will make are a great addition to floral arrangements, gift packaging and so much more! 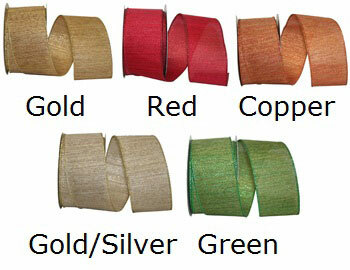 ....Please select Copper Gold Gold/Silver Green Red .